But here you are, wanting to bring color and pattern into your space. How do you get there from here? Aren’t there any rules to follow? 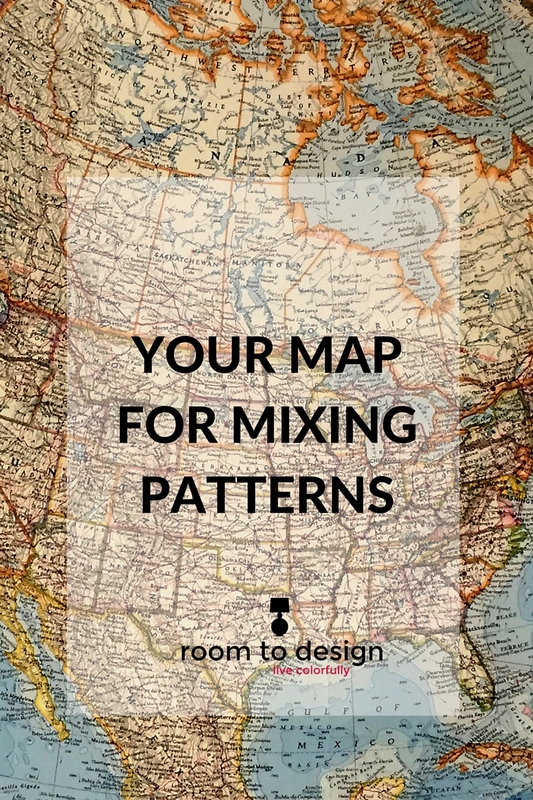 Instead of “rules” for using pattern in a space, I’m going to give you a map for mixing patterns in fabrics, rugs and décor that will help you arrive at a space you love. Just like when you ask Siri to get you to a destination, I will give you several ways to get there and I may even re-route you on the way, taking you down a road you hadn’t planned on travelling. You're sitting your space, you look around and see beige. Or maybe white, or eggshell, or taupe. Whatever you want to call the neutral tone, it's not speaking to you. It doesn't say, I'm fun. I'm happy, I enjoy being in this space. That's ok, we can use this neutral color as a back drop to inject some happy color with just a few squares of fabric and some soft feather down. I'm talking pillows, people! In this palette, I choose a large scale floral print that would make a great focal point on a neutral back drop. This fabric is an organic print, it has lots of movement and shapes that are found in nature. Typically, organic patterns are florals, botanicals or Ikat design. Balance organic patterns with geometrics. The distinct lines of geometric patterns add stability to the free flowing movement of the organic shapes. Along with repeating geometric shapes, stripes, plaids and herringbone are also considered geometric patterns. Varied visual weight also will add depth and interest to the design. By mixing small, medium and large scale patterns, the individual patterns will complement each other without competing for attention. A coordinating solid echoes the color from the inspiration fabric and gives the eye a place to rest. It can also be used as a welt on a pillow to frame the large floral and give a nice detailed finish. You can take the concept of using organic and geometric patterns in varying scales and use it not only for pillows, but for other elements of your decor. Does your rug have a large scale organic pattern? Put a smaller scale geometric on a chair. Use a medium scale abstract pattern on draperies and bring in a large scale floral on a chair. Oh the places you will go! Here are a couple more examples of fabric palettes to help you map out your happy place. If you are still directionally designed challenged, drop me a line. I have the map and I can get you where you need to go!